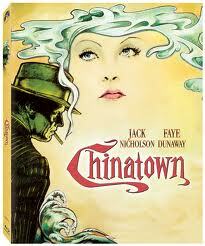 ‘Chinatown’ Blu-ray Announced and Detailed!!! Roman Polanski’s AWESOME 1974 crime drama starring Jack Nicholson and Faye Dunaway will be released on blu-ray April 3rd. The film was nominated for 11 Academy Awards including Best Director and Best Picture, but only won for Best Original Screenplay. ‘Chinatown’ will have a 1080p transfer and will have a Dobly TruHD 5.1 audio mix as well as Mono. It will also have several extras an a collectible booklet. Extras include: Commentary with Robert Towne and David Fincher; Three-part Water and Power documentary with Robert Towne; Chinatown: An Appreciation retrospective with filmmakers Steven Soderbergh, James Newton Howard, Kimberly Peirce, and Roger Deakins; Chinatown: The Beginning and the End; Chinatown: Filming; Chinatown: The Legacy; Theatrical Trailer; and a Collectible Booklet. It’s great to see Fincher, Soderbergh, and Howard on this disc. I just hop there will be a Criterion version of this film sometime in the future with Nicholson commentary. Pre- orders are available. ‘Reptilicus’ and ‘Tentacles On Blu-ray From Scream Factory!!! Blu-ray Announcement: ‘Batman’: 25th Anniversary Edition!! This entry was posted on Wednesday, January 11th, 2012 at 6:49 pm	and is filed under News. You can follow any responses to this entry through the RSS 2.0 feed. You can skip to the end and leave a response. Pinging is currently not allowed. « Find Out Who Hosts SNL in February!! !